I have a bit of a love/hate relationship with Tessa Gratton's books. BLOOD MAGIC was a 5/5 read for me, whereas I couldn't even finish THE BLOOD KEEPER. 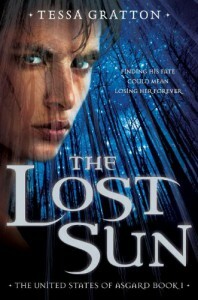 The premise involving a modern day Norse Mythology infused world completed grabbed my attention, but THE LOST SUN itself struggled to maintain even a low level excitement for most of the book. THE LOST SUN is slow. That's the kindest way to put it. Very little happens to adequately fill these 368 pages, and the characters aren't interesting enough to pick up the slack. Soren is really quiet and broody, Astrid lacks personality, and Baldur is so underutilized as to be fairly pointless in any of his scenes. The book is essentially one long road trip. You'd think in a world where mythological gods like Thor and Loki roam around freely, that there would be all this fantastical epic stuff going on. Not so much. There are news reports of savage troll attacks and mob swarms, but we don't see them first hand. Instead we stay in cheap motels, pick up take out, and practice sparring...yeah, that's exciting. The big disappointment is how small this world feels. I really wanted to feel and experience the gods and the way the world is different because of them. THE LOST SUN is written in such a way that it assumes readers know all about the United States of Asgard and is rather ho hum about it all. Sure days of the week have different names and there are different holidays etc, but it doesn't come across as grand an epic like mythology should. The ending does pick up in terms of the plot, but since I felt pretty indifferent towards all the characters, their plight was lacking impact. Ultimately, nothing stood out enough here to make me interested in reading the next book in the United States of Asgard series.